When people know you use homeopathy one of the things that happen is some of them will tell you it’s about placebos and mind over matter. I’m never quite sure if they feel it’s the problem or the cure that did not exist but still they blindly rubbish what they don’t know about and assume some authority by telling you about prescription or over the counter drugs which are the ‘best’ solution. These same people will usually know about and even use Arnica for injuries and bruising but their judgement will still stand. Two flaws in their arguments are the successful treatment of babies and young children and the successful treatment of animals. The more sceptical of the two are animals. They do not accept that you are treating them with love and a belief that what you are giving will work which can be said of children, so there is no placebo effect. In my experience of both pets and livestock, homeopathy can produce some startling results. Clover was a mixed breed white dairy goat. She kidded twins every year, always a boy and a girl and she was very milky and very maternal. She loved her own kids and she grew them well and produced enough milk for the house too. When I milked her she had to wash and nibble my hair as she did with her own children as a bonding gesture. During 2001 there was a Foot and Mouth outbreak and all animal movement was stopped without notice to prevent the spread of the disease. This affected daily routines and left our goats of all ages living in a big brick shed where they normally just slept overnight. Due to a technicality they could not leave the shed without a special licence or to go straight to slaughter. The licence would not have been considered as my area was considered to be very high risk and slaughter would only have been a consideration on welfare grounds and we needed to make sure that was not necessary as these were mostly productive pets. Clover was about 9 or 10 years old by this time and in kid but as we kept our own males we were not sure when she was due to kid. One morning at breakfast time we found Clover had kidded and the girl kid was dead. The boy was clean but Clover was not interested in him or in anything else. It was probably the other goats who had cleaned this boy and he had not fed so was in a very critical situation as was Clover. Against all the rules, I bought the kid into the house to feed him and carried Clover in a wheelbarrow to a garden shed. Clover would not even look at her live kid when he was fed and warmed and given back to her. She did not have milk anyway…the goat that had fed two kids and produced a few pints of milk a day for the household for the last 8 years had no milk. We tried to keep a bond but there was none and Clover was by now seriously ill. We kept the kid in the house where he could be fed and kept warm. After about a week, Clover realised she should have a kid somewhere and began calling for him but as she was so weak we had to keep him away in case she laid on him and killed him. Eventually we managed to get a vet out to her (he came out of retirement to help the FMD crisis) and after administering everything he could including massive amounts of vitamins he suggested that alongside the injections he left, we should give her a bottle of Guinness every day. He didn’t hold out much hope for her survival though there was no inflammation or infection and he said she was just very depressed. We tried the Guinness but as Clover was a sweet sherry sort of lady, this did not go well and it had to be forcibly syringed into her every evening. She was barely eating and now was skin and bones but was standing up and picking at hay. Eventually restrictions were lifted and the animals could be moved to more suitable housing but Clover was still too ill to move. After all this time, I looked up my homeopathic book and I decided, having known her so well for many years that she was grieving for her babies so I got her some Ignatia. Less than a week later, she was eating better and taking an interest in life again. The same Vet came out for another animal and we showed him Clover. His reaction was of disbelief, he assumed she had died within days of his previous visit. We chose not to let Clover have any more kids but the following spring we were persuaded to take a day old bottle lamb on. Clover found him in the garden the next day and started to mother him so we let her have him in her stall at night and we just took his bottles to feed him with her fussing over him. A few days later we noticed she had started to produce milk and feed him. He became her last baby and grew up to be a big sheep that we could not part with. 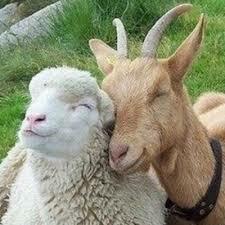 Clover lived a couple more years and her beloved sheep was her companion in the goat yard. This year, on an impulse, I bought Horace, a bottle lamb who was about 2 months old to become my ram for my flock this autumn. He settled well but kept getting off days where he would not eat his feed and could only manage part of his bottle. This sorted itself quite quickly but returned often until one day he began the morning by refusing any of his bottles, he would not touch his feed and when his stablemate Lottie went out, he wouldn’t move. He just stood hunched up and was obviously not well and had bad tummy ache. When Lottie was due her afternoon bottle, I gave Horace a Nux Vom 30 and decided to repeat this again in a while. I put the pill bottle back in my pocket and went to offer Lottie her bottle when Horace pushed her aside and drank the whole bottle. This worked in less than a minute. He has not had tummy troubles since. Flatlamb, her story began at a neighbours farm when she was about 10 days old. The farmer was watching lambs play when Flatty jumped sideways and in mid leap she fell sideways and could not get up. After a while of thinking her winded and that she would get back up soon, the farmer carried her into one of the bonding pens with her mum. By evening it was obvious she could not reach her mum to feed so she was offered a bottle which she drank. A week later she was still on her side and still on her bottle but from the second morning she learned to move around by forcing her legs into anything that offered leverage to paddle herself around. Antibiotics and anti-inflammatory injections were given but they made no difference other than to cause scouring. She had a spark that made it very hard to make the call to kill her. So the decision was made that I would have her, bring her home and see if time would help. She was called Flatlamb as that is how she was, flat out on one side, whichever side she was put on when she had finished her bottle. I don’t remember why I decided on using homeopathic Silica or what potency, though it was probably a 30c but about 2 weeks after the initial incident, she was given one pill 3 x a day. On the third day, she was able to sit like a dog or cat by wedging her feet against cupboards to push herself up. By day 5 or 6 she began to totter around on her knees in a very uncoordinated fashion. Day 10 and she could walk on her knees up the two steps from my kitchen to the rest of my house. After that she began to walk properlybut her front and rear end seemed to work in isolation from each other and within a month she could run but not stop well as her back end kept going at the same speed after the front end had slowed down. She was a very peculiar creature and though this improved a lot during her first summer, she was nearly 2 years before it was unnoticeable. She went on to be one of the foundation ewes for my flock as we could not bear to part with her ewe lambs as she was such a character. A couple of weeks ago, for the first time in about 40 years of poultry keeping, I had a hen with a prolapsed vent caused by laying an egg which was stuck within the membranes and the vent was tightly stopping the egg from being released. Armed with some warm soapy water and coconut oil I removed the egg, pushed back what protruding flesh I could using coconut oil and put the hen to bed in a cat basket using an empty paper feed sack for bedding so nothing could get stuck around or in the vent. I gave Sepia 200 into her beak then dissolved a tablet of the same into her water and whisked to sucuss it. The following morning she looked okay so I repeated the Sepia into her beak and her water, fed her and left her in the basket until morning 2 when I let her out to keep an eye on her. She seems fine, and seems to be laying, though at this time of year I know there are hidden nests everywhere and none of her sisters lay in the nest boxes provided. Her comb is bright red though which indicates being in lay and after 2 weeks any problems would be evident. A new family to the hamlet where I live took a passionate liking to some of my sheep and having fenced their hedgeline, they decided to get a few orphan lambs for their children to bottle feed and to be their useful pets, being more interesting that a lawn mower. The first to catch their attention was a pair of twin brothers whose mother had died soon after birth. Both were blind and very slow to respond both to bottles and moving around so the breeder felt they should stay with her until they could drink from a bottle well enough to manage enough milk not to starve. At a couple of weeks after one of the boys had died, the family bought the remaining lamb home. They very excitedly stopped to show me the lamb that was laid in a dog crate in their car, surrounded by wrapped up hot water bottles. When they took it into the house it did not try to stand but I assumed it was because it couldn’t see and was used to being carried around. He was certainly a pretty lamb, black with a white blaze on his face, white feet and tail tip. He was named George after George Michael as, I was told, he was a good looking lad. In conversation a few days later the lady asked me how soon he should be walking. Big alarm bells! He would cautiously stand but would keep both front legs together and just move his back legs so went round in circles before laying down again. The two young girls in this family were just 3 and 6 and loved this precious lamb. I gave it a great deal of thought and pieced together that with the blindness and weakness of both lambs, the mother must have had an infection which was either in or spread to her womb. I wanted to try Arsenicum and checked my thoughts on this with one of the college teachers. They said try it so I went armed with my bottle of little white pills and the family decided to give it a go. Within a day George was less cautious about getting up and down, had begun to walk and actually managed a skip. The vet had seen him a couple of days after he arrived and checked his eyes etc. His temperature was normal and his pulse. The next additions were two bottle girls, collected from a farm with lots of other orphans. On the way home they both had explosive scours in the car and this carried on. Neither would drink a full bottle and they were cold and listless. Antibiotics and probiotics and other medicines were administered. A heat lamp provided and they should have picked up fast but a week later they were no better so another visit to the vet and another set of the same injections and the vet felt they had very low immune systems and clearly doubted their chances of recovery. I gave them Merc Sol as there was no chance of getting Merc Corr, which I wanted to give, for another day. I seriously doubted there would be a change very soon but it might buy these two lambs some time until the other remedy arrived. By the time the better suited remedy arrived the scours had stopped, the lambs were hungry and could finish a whole bottle and no longer needed the Merc Corr. A few weeks later, they went to the vet again and she checked George over and HE CAN SEE!!! Not well, this I hope will improve, but well enough to be out in the paddock with his friends and to play and behave like…well…. like a sheep. Caulophyllum is a remedy which is an essential in my lambing kit. Mainly the two things I will not be without are Caulophyllum and stock lubricant and even the lubricant can be replaced by soap flakes or washing up liquid in an emergency. I have successfully lambed ewes with ringwomb ( a spasm in the neck of the womb which holds it closed) using a few doses and a good dollop of either desperation or determination. It is also a right hand remedy for ewes trying to lamb a large single. It works fast and efficiently and in the words of my now retired vet, “if three doses haven’t worked, nothing else will so we need to get her into surgery”. Oh yes Caulophyllum was in his tool kit too. Most of my stories have been about sheep. I have plenty of them and with their stoic tendency to carry on without sign of illness until their condition is critical I have had plenty of need to use homeopathy on them. Most shepherds will reach for a bottle and syringe and I still need to do this but I prefer to first try something gentle on the animal and strong on the problem. Obviously when needed, a vet should be consulted and their diagnostic skills are invariably finely honed. A home diagnosis is usually part experience and part guesswork but in emergencies or until you can get the animal to the vet a lot can be prevented or alleviated if you know the animal well or the problem is obvious. If in doubt and you have to wait for a vet to arrive, Aconite can help with shock and Arnica with injury. Remedies will not interfere with what the vet will give but it might gain some time for the vet to have a chance.